In Poland a newborn has to be vaccinated within 24 hours against hepatitis B and tuberculosis. As I understand it is good to be vaccinated against both, I do not see the need to hurry so much. Hepatitis B is transmitted sexually or by blood. The former vector is definitively unsuitable for a newborn, and the latter... Well, I do hope so far all Polish hospital adapted to Ignaz Sammelweis advice on antiseptics. In case of BCG vaccine against tuberculosis (containing alive bacteria) there would be an additional risk if the newborn's immune system were in any way impaired which is unknown within first 24h. It is not that tuberculosis is common disease in Poland - is endemic (probably due to the obligatory vaccination indeed). What possible biological benefits are there to vaccinate a newborn so early? 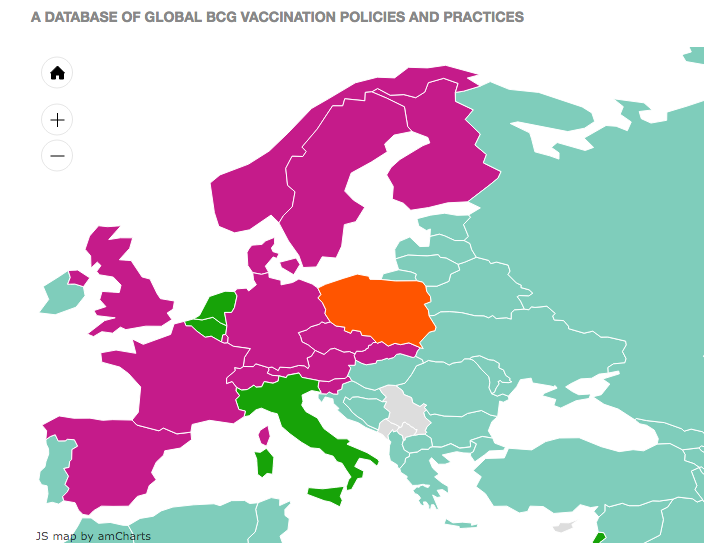 Especially which of them prevail over possible risks of BCG vaccination? I'm admittedly speculating a bit here, but based on what I've read it seems that the main reasons for "as soon as possible after birth" are (1) to allow for development of immunity and (2) logistics, i.e. increasing the actual coverage achieved. BCG vaccine induces delayed type of hypersensitivity reaction and cell mediated immunity (CMI) in the host 4–8 weeks after immunization. Rescheduling of BCG dose, from twice weekly to daily, the coverage of BCG and OPV zero dose increased from 54% (in 2014) to 78% (in 2015), and a marked increase from 8.2% to 42.9% was noted for the birth dose of hepatitis B. Is Poland a high-incidence Tb country? Some research studies suggest that delaying vaccination for a few weeks may have different (better or worse) effects (e.g. here, here). In the US, infants are vaccinated against Hep B at birth and again a month or two later as well, because of the risk of maternal transmission. If the mother is known to be HepB positive, HBIG will also be administered. Perinatal HBV transmission can be prevented by identifying HBV-infected (i.e., hepatitis B surface antigen [HBsAg]-positive) pregnant women and providing hepatitis B immune globulin and hepatitis B vaccine to their infants within 12 hours of birth. The reason for the HBIG is obvious, but it doesn't last for life. Therefore, the vaccine and its booster. Hepatitis B virus (HBV) infection in a pregnant woman poses a serious risk to her infant at birth. Without postexposure immunoprophylaxis, approximately 40% of infants born to HBV-infected mothers in the United States will develop chronic HBV infection, approximately one-fourth of whom will eventually die from chronic liver disease. In countries where HepB is not prevalent, there is little cause to immunize at birth. However, it is too common in the US. The risk of HepB vaccine is low. The seriousness of the disease is high. It is not only the mother who might be a carrier. There are many unidentified carriers in the US. That makes the risk-to-benefit ratio low. Driving your newborn home in an automobile is probably more of a risk than the vaccine, but most people do so anyway, and do so many, many times over the course of the baby's life. In the US, we do not routinely vaccinate against TB, so I cannot address that issue with any degree of expertise. The risk-to-benefit ratio is not as low as for HepB. It is given to children who are continuously exposed to someone (say, a parent) with active TB, or in certain communities where TB is very prevalent. Obviously, if the risk of SCID (severe combined immunodefficiency) is high, the risk of the vaccine is much higher, and some infants have died from it. Discussing the risk to benefit ratio of all infant vaccines is too broad for this venue. Not the answer you're looking for? Browse other questions tagged immunology immune-system epidemiology vaccination immunity or ask your own question. Why human body cannot defend against HIV? If all B cells are present at birth, why should the primary response to an infection take longer than the secondary response? Why are human immune systems comparatively weaker than other animal immune systems?